Increasing my geek cred with Facebook exchanges that manage to discuss Star Trek, J.J. Abrams, James Bond, the Hobbit, and Sherlock Holmes. . .this is all one conversation, mind you. Eating healthy meals then totally blowing it with either a bad dinner (Pizza!!!) or snacking (I really shouldn't have made those cupcakes. . .it's like they are following me around the house). Discovering that I like sweeping so much more than vacuuming. Vacuuming is my least favorite chore. The noise, the heavy machine, going over that same piece of lint five times and still not getting it off the carpet. Sweeping, however, feels like one of those Japanese zen garden things that people make lines in with tiny rakes. . . at least that's what I've always imagined playing with one of those things would be like. Finally got around to starting a garden of sorts, and no, I'm not talking about my avocado pit that is refusing to sprout. I have wanted a vegetable garden for awhile now. It wasn't going to happen in Japan; we didn't have a yard. When we moved in to this house, we also took possession of a huge yard. . .full of weeds. There really isn't any grass out there. Just random weeds. Matt wants to eventually kill all of the weeds and plant grass, but since I know him and his love of strong chemicals, I am actually not looking forward to him doing this. So rather than clear a patch of land for a large garden I went and got pots and seeds and potting soil and I'm making a garden in a couple of planters on my front porch. I also picked up some seed starter soil. Coryn really got into it. We were at Walmart and on the way back to the garden center I grabbed a purple plastic shovel as a present for her. She loved that. It temporarily was enough to distract her from the huge display of bicycles (I've never seen her eyes get as big as they did looking at that aisle filled with bikes. She didn't say anything, just gaped. I think she wants a bike). Once in the garden center, I headed straight for the planters. At the time I just wanted to do an herb garden. I thought it would be a fun way to start, and herbs seemed manageable. Coryn, however, sighted a rack of seeds and next thing you know, she was pushing a packet of blue morning glory seeds in my face. "Can we plant these blue flowers?" she asked. Twenty cents for the packet. . .I gave in. She wanted to buy more flowers, but I led her away and said the blue ones were enough. However, the planters were right next to more seed racks, these ones filled with vegetable seeds. "Can we plant these mushrooms?" she asked, pointing to one packet. "Those are beets, not mushrooms, and no, we're not planting beets." "Can we plant green beans?" We ended up getting lettuce, cucumbers, carrots, oregano, basil, and cilantro. . .and morning glories of course. When we got home I decided to skype with my mom and Coryn held up every item we got one at a time in the cutest show and tell. We then put everything in the pots. . . this is where my husband has changed me. I was seriously going to do this in the middle of my kitchen but he happened to call and I thought, "What would Matt do?" and I realized that Matt probably wouldn't bring large quantities of dirt into our kitchen. . .
We also bought some wooden butterfly cut outs and tempura paint and painted those this evening, which is again something Matt probably wouldn't have done (bring paint into our living area), but I was careful and spread out some papers first. 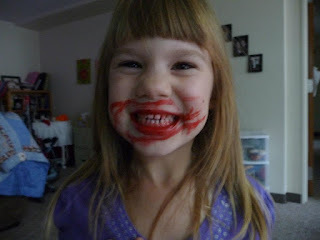 Coryn is messy like Mommy (older picture, not related to recent activities). Coryn got into gardening with Grandma Tawny when we were back in Oregon last month.